Chiaccona für 2 Soprane, 6 Gamben (oder andere Streicher) und B.c. 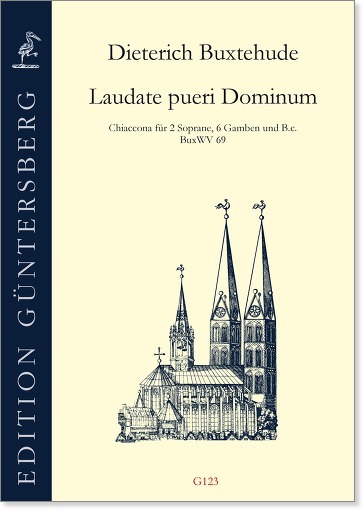 Buxtehudes festlicher Psalm Laudate pueri Dominum wird hier zum ersten Mal in einer praktischen Ausgabe präsentiert. Die in den Handschriften explizit genannten Gamben spielen am besten in der Besetzung DDAABB. Die Schlüssel unserer Ausgabe wurden so gewählt, dass die Gamben auch durch 2V+2Va+2Vc ersetzt werden können. Vorwort von Annette Otterstedt. "For those looking for a different style for their consort, these works are a perfect introduction to the German cantata style and show us the musical genius of Dieterich Buxtehude. 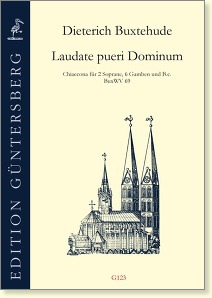 Güntersberg's edition present practical, well-edited works that respect the originals. It is wonderful to see an editor who is so dedicated to bringing the gamba playing public lesser-known works." "If you can get 6 viols and 2 sopranos together this would be a very exciting piece to play and sing, and it is refreshing to have something festive including viols. The viol parts are not difficult, but still interesting to play, and the whole effect is very sumptuous - well worth having for the larger gathering."